Y’all ready to get your greens in? This Turnip Green Dip is one of my most favorite recipes from my cookbook. (It’s so hard to believe that it’s has been out for 3 years now!) 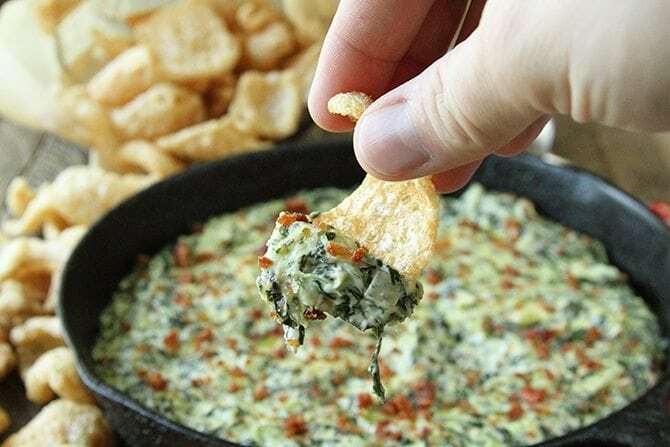 It’s always been a hit with family and friends and is the star at any party. 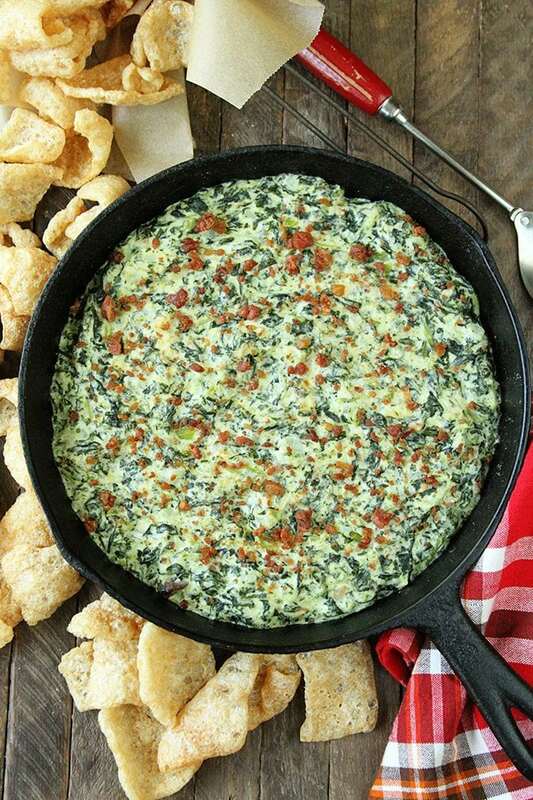 I love the fact that even folks who claim to dislike turnip greens end up devouring this dip. 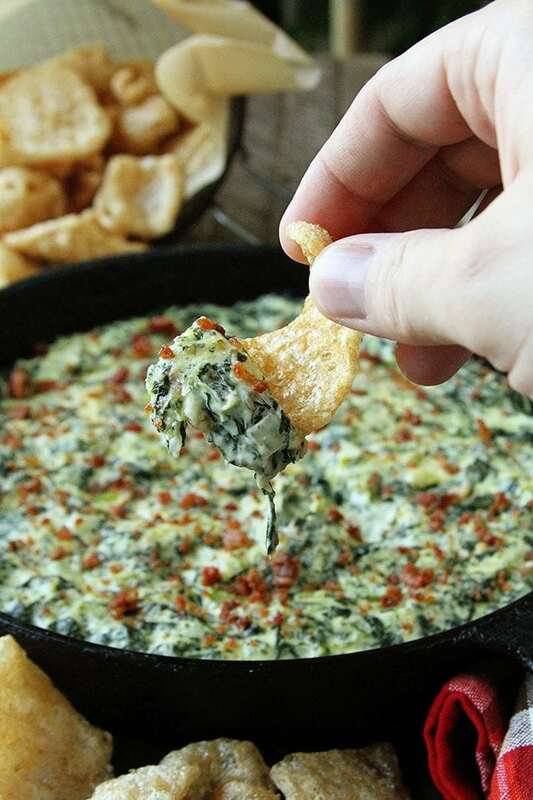 It tastes so much like it’s spinach dip counterpart, some folks won’t even realize the difference. I really like the little bite that the turnip greens give it, though. You don’t get that with spinach. It might take a few steps and a little time, but it’s super easy to put together. You’ll have it ready in no time. 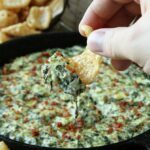 Whether it’s for a tailgate, family gathering, or a big potluck, I promise folks will love this one! 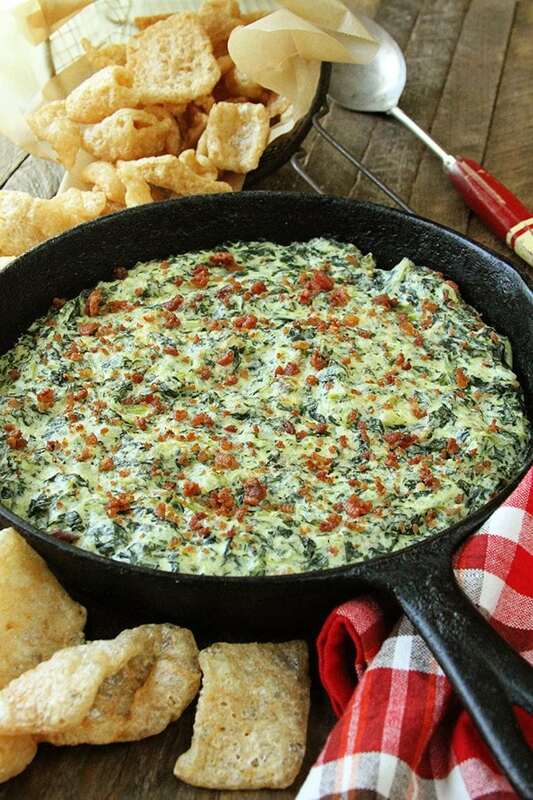 It’s best served warm with some tortilla chips or with my personal favorite… pork skins! Y’all enjoy! Preheat the oven to 350°. Grease a 2-quart baking dish. In a large skillet cook the bacon over medium heat until crispy. Remove the bacon, drain on paper towels, and crumble. Carefully pour away all but about 2 tablespoons of the bacon grease; return the pan to the heat, and add the onions. Cook about 3 minutes. Add the turnip greens and cook 8 to 10 minutes. Add the Alfredo sauce, cream cheese, salt, pepper, and garlic powder. Cook until the cream cheese has melted and the mixture is bubbly. Stir in the crumbled bacon. Transfer the mixture to the baking dish, and bake 25 minutes. Remove from the oven and sprinkle with Parmesan cheese. Turn on the oven’s broiler, and return the baking dish to the oven for 5 minutes. Serve with tortilla chips or fried pork skins. Good Gosh-a-Mighty!! This is right up my alley! Just wanted you to know you have a new fan! I found you through Christy Jordan, and have been huntin’ through your recipes for a little while. All of them look amazing! But this one is perfect! My hubbie and I are both doing the Keto (low carb- high fat) diet – so this one is perfectly legal for us – even with the pork skins! Hilarious! Yes, this would be the perfect keto recipe! I did that for a while and pork skins were a lifesaver for me! Hope y’all enjoy! This stuff is crazy good! It’s probably a good thing I’m going to work today, because it might not be safe to leave me alone with this dip. Thanks for all your hard work to bring such great joy into my life today. Ha! I’m so glad you enjoyed it, Jo! Can’t wait to try this recipe! However, this Southerner is now in Iowa, and can’t find the turnip greens ANYWHERE! Will chopped kale work?